The Intel Haswell Extreme (Haswell-E) edition processors have taken the desktop computing world by storm. They are basically capable of doing just about everything possible, and really well too. Sure, we all would love the biggest and baddest processor but that means spending a lot of money. Then you have worry about which X99 motherboard best suits your needs. 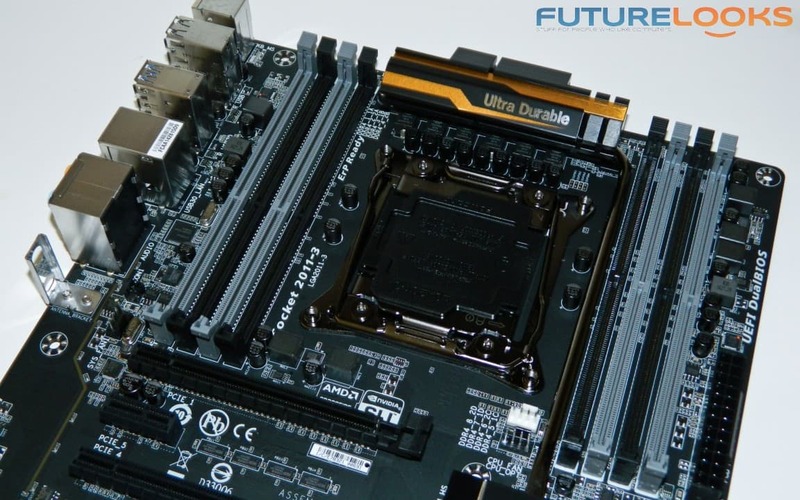 Maybe you don't need all the high end connectivity that drives the cost of X99 boards upwards, or maybe you just need a solid board that will let you enjoy your top end CPU. The GIGABYTE GA-X99-UD4 motherboard is one such board that promises to deliver stability, reliability, and performance whether doing something task intensive or playing your favorite epic game. It doesn't cost near the premium of other boards so we're curious to see how it stacks up. GIGABYTE offers, from left to right (above) the following GA-X99 series boards: UD3, UD4, UD5 WIFI, and UD7 WIFI. These represent their Ultra Durable line up of channel boards. They also offer an OC Force and G1 Gaming line but that's a different animal for a different review. 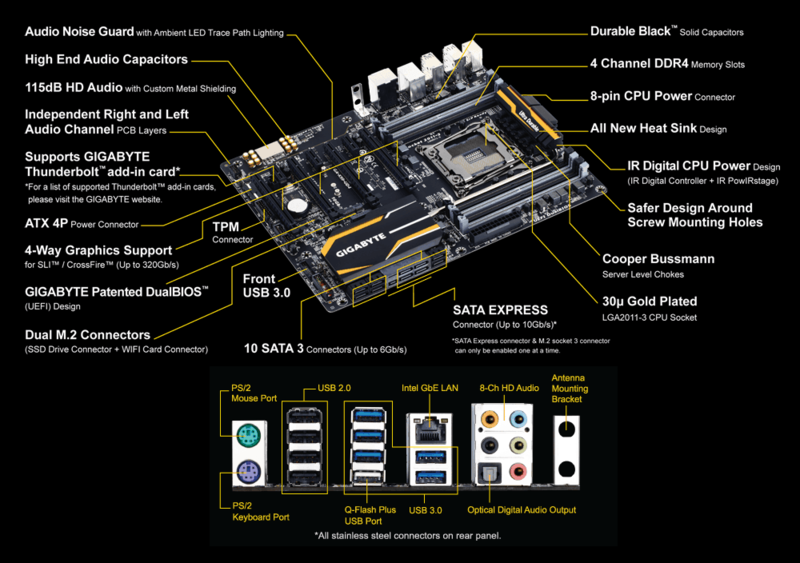 I'm sure a Black Edition will also be in the works soon, as that type of workstation level testing would be great for this level of motherboard. 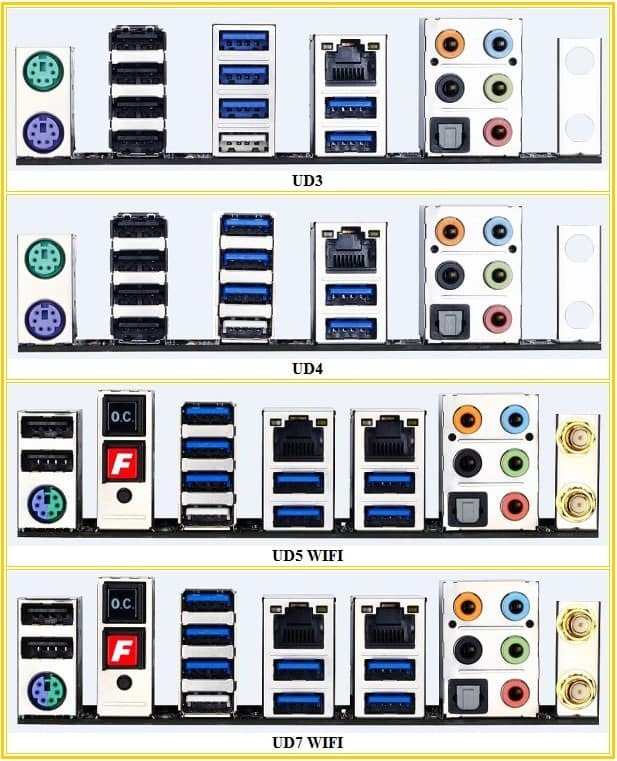 Features that separate the boards are higher overclocking, network connectivity as well as WIFI and Blutooth, and automatic OC (overclock) buttons. Otherwise, they all share the Easy Tune and App Center software. Above, we put together the IO comparison table so you can plan for your own system build. The UD5 and UD7 come with dual antennae WIFI as part of the default package. The single white USB port is GIGABYTE's new Q-Flash port for updating the motherboard BIOS even without a CPU or memory. The onboard ITE controller will do it automatically and the FBIOS LED will let you know of the progress. Since top chipset boards usually end up sticking around for a very long time (we still have X58 systems in use around here), this is a wonderful new feature that will make CPU upgrades down the road a piece of cake. So, what's all this connectivity cost? Overall, the GIGABYTE GA-X99-UD4 is a pretty attractive board for a mere $258.99 US. In fact, current pricing for the channel boards ranges through $240, $260, $298, and $325 respectively, so it sits in a very solid fighting range in pricing. We'll just have to see if stability and user experience balance out because lower prices can sometimes mean a lesser experience. Some of the features new to Intel's mainstream Z97 chipset are also native to X99. In that list there's SATA Express and dual M.2 SSD interface ports. They're stacked in case you want to add two. The ports support both M.2 PCIe and M.2 SATA. Supporting both types of SSDs is actually a smart move as users aren't stuck to one format. One of the coolest features we've seen the last couple years is the LED back lit IO Shield and Chipset Ambient Lighting. The IO shield actually glows blue when active, and users can select from four modes. Personally, I wouldn't mind seeing some other type of lighting on the board PCB do the same since the IO is in the back and not typically not seen (although we can see this as a huge benefit when reaching behind the case to plug something in). Other features worth mentioning are the continued goal of providing better than stock integrated audio performance. The board features independent left and right audio channels as well as separation from the rest of the PCB to eliminate feedback. An amplifier paired along with the Amp-Up audio implementation means more robust audio. And, you really don't have to worry about clean CPU power the last couple generations thanks to the PowIRstage ICs and IR digital power controllers. Those are used across all the boards. Let's have a look inside the box and see what you get in the package next!